Using our new floor/ceiling projections, this season we will be able to simulate all of the DraftKings Pick ‘Em tiers. We’ll share the results of these simulations in a premium article for subscribers along with other ideas about attacking the Pick ‘Em slate each week. The highest total game of the week is ATL at PIT at 58, pitting two strong offenses against two weak defenses. 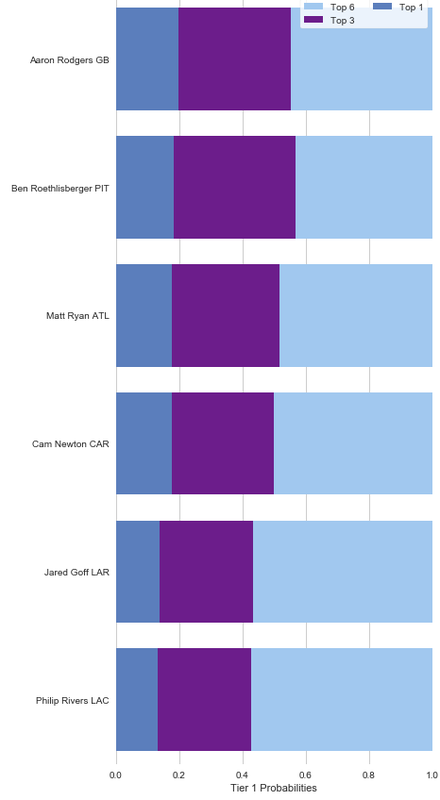 Expect the ownership to follow, especially on Ben Roethlisberger (PIT), who currently carries our highest main slate projected ownership at 11.8%. No other QB has a projected ownership of 8% or higher. Roethlisberger is enticing, even as chalk, as he has our highest DK projection of the week and provides plenty of opportunities for stacking as Antonio Brown, JuJu Smith-Schuster, and James Conner all in different tiers. Rodgers’ rushing ability, even with those baselines scaled back due to injury, gives him the edge at those percentiles, while Roethlisberger’s high team total swings things back his way at the 95th percentile. It will be important to keep an eye on the health of Rodgers’ weapons. On Thursday, Davante Adams, Randall Cobb, and Geronimo Allison all missed practice. We may end up downgrading the team passing baselines for Green Bay, depending on final injury reports.